Optokinetic nystagmus, or OKN for short, is the eye movement elicited by the tracking of a moving field. It differs from smooth pursuit which is the eye movement elicited by tracking of a single distinct target. As moving fields contain within them distinct targets, OKN generally contains within it smooth pursuit. As a consequence, usually OKN performance (gain -- ratio of eye tracking velocity to target velocity), exceeds that of smooth pursuit. 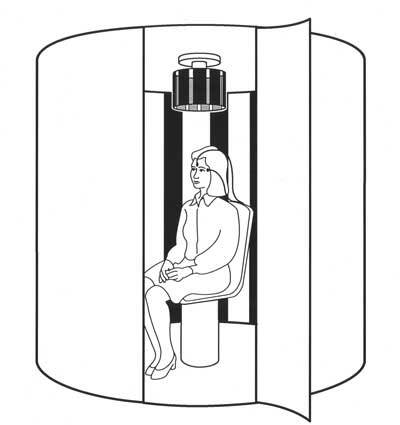 Example of OKN being elicited within a rotatory chair enclosure. The stimulus that most closely matches the definition of OKN is to use a full field surround such as is shown above and below. Even these are compromises as individual bars can be tracked, and there are usually distinct objects in the visual field that can be fixated. Accordingly, the "best" OKN stimulus is real, physical surround that rotates, containing a pattern which has no distinguishing features such as a random dot pattern. Stripe projector -- the slotted can shown in the figure above is a good method of producing OKN. While the projector shown above is rather expensive, cheap devices such as used for "disco" parties may be usable. The main problem with it, and other projected systems, is that people can fixate on still objects in the room. Still, we think that this is a reasonable method. LCD projector -- a convenient but rather ineffective method of eliciting OKN is to use the LCD projector. The LCD projector has the same problem as the stripe projector -- people can fixate. Also, because it is not anywhere near a full field, it does not stimulate the entire peripheral field. It is marginally better than a light bar. We recommend against using this method. A variant of the LCD projector method is to use an array of large televisions arranged in a half circle. Above is an example of this from our practice in Chicago. Patients in our practice can run the OKN stimulus with login credentials can run the software using this link. We think this is better than any of the projection systems, but not as good as the physical drum (see below). Physical drum -- the best method of eliciting OKN is to actually rotate a physical drum around the person. A light-weight drum can be constructed out of cloth or foam-core, and be driven with a servo motor. If you have the space to do this (and also a lot of interest in OKN), this is the best way to do it. Light bar. An inferior method of eliciting smooth pursuit and OKN. It is not easy to build a good OKN full field stimulator and clinicians as well as commercial vendors have attempted to use other devices. ENG vendors often sell a "light bar", consisting of an array of LED lights that can be controlled in such a way to produce moving bars of light. An array of LED's is illuminated in a way such that a bar of light moves to the left or right. While technically this stimulus does stimulate the peripheral visual field, it only stimulates a small strip of it. We suggest not using light-bars for optokinetic stimulation. This stimulus is clearly not a full field, contains easily tracked lights, and mainly is an alternative method of eliciting smooth pursuit. In the author's opinion, this type of OKN has no diagnostic value over simple pursuit. Another commercial variant is to use a video-projector to display a moving field on a portion of a screen. This method is a little better, as an appropriate pattern may have no individually trackable portions, but still it does not produce a full field and because of this is vulnerable to persons fixating on the edges of the projected image. In the author's opinion, this method of eliciting OKN is of unproven value but worth considering. Clinicians sometimes may try to elicit OKN using simpler devices such as the drum below. This device, not even pretending to be a full field, is even more of a "pursuit" stimulus than the larger drum methods shown above. Still, it can be useful in evoking convergence retraction nystagmus in persons with dorsal midbrain lesions, as well as asymmetrical tracking in persons with latent nystagmus. "OKN" can also be elicited by strips that contain squares of alternating colors, tape measures, and even busy ties. The usefulness of these devices, in the author's opinion, is questionable. Both types of OKN stimulators can be obtained from "good-lite"
Normal values for OKN gain are similar to those given for pursuit gain, or slightly greater, but OKN gain is less strongly reduced at high frequencies (27). While normal values are available for OKN phase, it is uncertain whether or not phase is affected by disease. Practically, OKN is best evaluated by comparing it to smooth pursuit, using the normal values developed for pursuit. Normally, people undergoing OKN testing adopt an eye position that is opposite in direction to the velocity of the OKN drum -- this is called shift of the "beating field". This is presumably adaptive as it allows people to "ride" their gaze evoked nystagmus as well as potentially have a longer period to track. When there are diseases of the fast phases, often beginning with slow saccades, the eye doesn't shift into the "beating field", but rather gets "hung up" in the orbit. This is seen in disorders such as PSP and some of the brainstem related cerebellar degenerations. There are several pitfalls unique to optokinetic testing. While less sensitive to attention than pursuit, because OKN is disturbing to some patients, there may be an active attempt made to suppress it by fixating upon an object in the room which is not moving. This pattern is easily recognized because these persons are generally otherwise normal individuals, and because their initial responses are robust. Also, many commercial "optokinetic simulators", are actually devices which elicit smooth pursuit. If one is using such a device, the diagnostic points listed below which depend on noticing differences between pursuit and optokinetic responses do not apply. References related to normal values for OKN/OKAN. Tijssen MA, Straathof CS, Hain TC, Zee DS. (1989) Optokinetic afternystagmus in humans: normal values of amplitude, time constant and asymmetry. Ann ORL, 98; 741-746. Peterka RJ, Black FO, Schoenhoff MB. (1990) Age-related changes in human vestibulo-ocular and optokinetic reflexes: pseudorandom rotation tests. J. Vestibular Res. 1, 61-71. 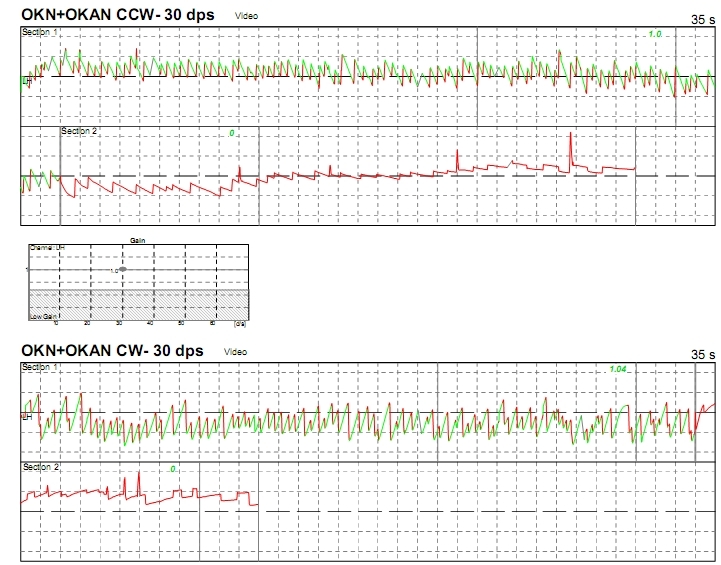 Calibration error is easily seen in this OKN recording.See the pursuit recording above (same patient). Here the clue is that this elderly patients is apparently tracking faster than the target. This is impossible without a technical error. Optokinetic nystagmus (OKN), like pursuit, has only minor diagnostic utility. Although OKN is more specific than pursuit, as it is not as affected by inattention and medication as is pursuit, it is also less sensitive. Presumably the relative lack of sensitivity of OKN to ocular and central disorders is due to the fact that OKN is the sum of two tracking mechanisms, namely the smooth pursuit system, which uses foveal vision, and a separate tracking system, which uses both foveal and extrafoveal vision. Congenital nystagmus : CN can cause gigantic asymmetries of OKN. The most common CN is latent nystagmus. Here there are typically huge asymmetries of OKN depending on the viewing eye. Very poor OKN in patient with retinitis pigmentosa. This man had "bony spicules" in his periphery, and very little peripheral vision. See other images of his pursuit and saccades. There are several causes of OKN abnormalities. There are three specific patterns of abnormal OKN, the first of which is symmetrically reduced OKN gain. Reduced OKN occurs in visual disorders, in pursuit system disorders, and in disorders of fast phases. While smooth pursuit is most affected by visual acuity, which represents foveal vision, OKN is produced both by foveal and extrafoveal vision, and thus may persist even when visual acuity is poor. In disorders which selectively affect foveal vision, a slow build-up of OKN may occur to a constant velocity stimulus (7). In disorders which spare foveal vision but abolish peripheral vision, such as extremely severe retinal pigmentary degenerations, no buildup of OKN is seen. Another context in which pursuit is normal but OKN is symmetrically reduced are patients with fast phase disorders. The most common clinical disorder of this type is a degenerative disorder of the brainstem called progressive supranuclear palsy (PSP), in which saccades are slowed and difficult to initiate. Accordingly, patients with PSP may have normal pursuit to a sinusoid or triangular wave target, but poor OKN to a drum moving at constant velocity because their OKN "hangs up" in the orbit. In other words, the eyes deviate out to the orbital edge and just stay there, instead of undergoing periodic resetting quick phases which bring the eye back to the center. These patients show a similar disorder of vestibular fast-phases, and get hung up when rotated at constant velocity. In the later stages of PSP, both pursuit and OKN are lost. Zee DS, Yee RD, Robinson DA. (1976a) Optokinetic responses in labyrinthine-defective human beings. Brain Res; 113:423-28. Fast phase disorders -- the "hanging up in the orbit" problem. There are a small number of patients with unsteadiness that have difficulty making rapid eye movements. For the most part, these patients have "PSP", or progressive supranuclear palsy, but there are also a few that have other neurological degenerations. During OKN, these patients don't reset their eyes efficiently, and theire eyes get "pulled" towards the slow-phase direction. This is seen in the graphic above. This does not apply to persons who have slowing of all eye movements (such as oculomotor palsy) -- this is a problem with brainstem circuitry. "Hanging up" in the orbit, also occurs during rotatory chair testing, as long as the chair goes fast/far enough to drive the eye "into the orbit". Normal persons reset to the other side of midline, but these people's eyes "pin" to the edge. The plot above is from a patient with presumed PSP. Nearly all of these people will also have slow saccadic eye movements, as shown on the right hand side above. This can sometimes be difficult to detect at bedside however. These people will "pass with flying colors", vestibular tests that do not exceed the orbital boundary, such as the VHIT test, but they will have difficult to interpret rotatory chair tests, with greater problems (i.e. lower gain) at low frequencies. One might encounter someone with normal phase but very low gain due to this interaction with fast phases. Asymmetrical OKN is not as helpful for diagnosis of central nervous system disorders as asymmetrical pursuit, mainly because it occurs so infrequently. Presumably asymmetrical OKN is uncommon because it requires lesions in two tracking systems -- foveal and extrafoveal. Only a minor asymmetry of OKN appears following complete unilateral peripheral vestibular lesions. Asymmetrical OKN is present in patients with maldeveloped foveas and also appears briefly following unilateral parieto-occipital lesions. Asymmetrical OKN is very common in persons with a type of congenital nystagmus called "Latent Nystagmus". The asymmetry depends on the viewing eye. If the person is amblyopic, this may mean that they are always viewing out of one eye. Baloh RW, Yee RD, Honrubia V. (1980) Optokinetic asymmetry in patients with maldeveloped foveas. Brain Res 186: 211-216. Reversed or inverted OKN occurs in patients with congenital nystagmus, which is discussed under the heading of fixation. 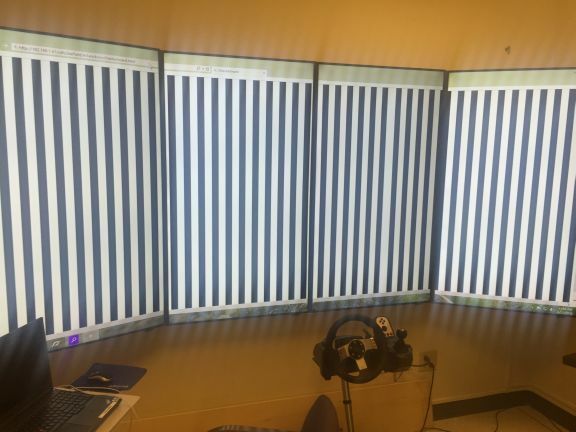 In these patients, the nystagmus beats in the direction of stripe movement. However, the slow-phase velocity of the nystagmus does not scale with the stimulus speed. OKN is much less useful than is rotatory chair testing as it is rarely affected substantially by disease. This is because it has redundant drivers -- the pursuit system and a lower level optokinetic following system that goes through the vesibular nucleus. OKN may be useful for detection of malingering or lack of cooperation because it takes quite a bit of effort to block OKN. Optokinetic afternystagmus. The lights go out in section 2, but the nystagmus continues on. This response was elicited in a Micromedical Rotatory chair system, using a full-field surround. Optokinetic afternystagmus (OKAN) describes the eye movements that occur after the lights are turned out for OKN, and the subject is in complete darkness. The darkness must be 100% -- small light leaks will obliterate OKAN. OKAN is only elicited by large field stimuli. 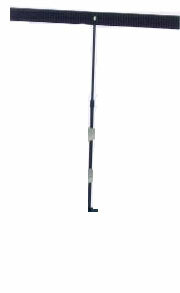 It simply is not elicited by the typical, small field stimulators used in clinical laboratories. If you are thinking about doing OKAN in your lab, don't bother unless you can somehow surround the person with a full field. It can be easily elicited by the complete surround methods shown above. OKAN is more sensitive to disease than OKN, but it is variable in normal subjects, which limits its usefulness. The figures above show the distribution of normal values for OKAN time-constant and slow-phase velocity from Tijssen et al (1989). Optokinetic afternystagmus (OKN) is the nystagmus that follows a constant velocity optokinetic stimulation, after the lights have been turned off. It is a weak response in humans, generally decaying from an initial value of about 10 degrees/second to zero, over about 15 seconds. There is a good normal database for OKAN (36). OKAN is characterized by three parameters, namely initial velocity, the time constant of decay, and the slow-cumulative eye position or SCEP. The most useful of these parameters is the SCEP. The lower limit of normal for SCEP used in the author's laboratory is 40 deg. The major pitfall to be aware of when attempting to use OKAN for clinical diagnosis is that OKAN varies substantially in the same individual from trial to trial (36). Averaging can be used to overcome this problem. Conditions that may result in abnormal OKAN are listed in table 12. There are three abnormal patterns to OKAN: complete loss, significant asymmetry, and hyperactive OKAN. Complete loss of OKAN, or bilateral reduction of the SCEP to less than 40 deg, occurs very commonly in patients with bilateral vestibular loss. Optokinetic afternystagmus can also be lost in central lesions that affect vestibular connections (8) There are far easier ways to diagnosed these conditions than OKAN, and we do not recommend it for this purpose. Asymmetry of OKAN occurs in patients with unilateral vestibular loss. A stronger response is found for drum rotation towards the side of lesion. Asymmetrical OKAN also occurs in many subjects who are otherwise normal, for uncertain reasons. Because of this normal variability, a significant directional preponderance in OKAN occurs in only about half of patients with complete unilateral vestibular loss. Abnormally increased OKAN may be found in patients with "mal de debarquement", which is a condition in which the vestibular system is overactive, and causes a prolonged "land sickness" (Brown and Baloh, 1987; Hain et al, 1999). Stimulants increase OKAN in guinea pigs (Marlinski et al, 1999). OKAN is generally increased in young women compared ot other populations (Tijssen et al, 1989). Brown JJ, Baloh RW. (1987) Persistent mal de debarquement syndrome: a motion-induced subjective disorder of balance. Am J Otol, 218-222. Tijssen, M., Straathof, C., Hain, T.C., and Zee, D.S. : Optokinetic afternystagmus in humans: normal values of amplitude, time constant and asymmetry. Annals Otology, Rhinolology, Laryngology, 98:741-746, 1989. OKN and OKAN have usefulness in detection of malingering, particularly in persons who are pretending to have bilateral vestibular loss in an attempt to obtain a legal result of some kind. Unfortunately, legal activity is common in cases of bilateral loss, because most are due to ototoxicity. As noted above, OKN is difficult to stop and someone who has no OKN is probably (but not always) not cooperating. OKAN has utility in bilateral vestibular loss, as it should be absent. Thus the OKN/OKAN test can detect uncooperative subjects in two ways -- lack of OKN, and presence of OKAN are both suggestive of a person who is either uncooperative or who has substantial vestibular function. Fletcher WA, Hain TC and Zee DS: Optokinetic nystagmus and afternystagmus in human beings: relationship to nonlinear processing of information about retinal slip. Experimental Brain Research, 1990. Hain TC, Zee DS. Abolition of optokinetic afternystagmus by aminoglycoside ototoxicity, Annals Otology, 100, 580-583, 1991. Tijssen M., Straathof C., Hain TC, and Zee D.S. : Optokinetic afternystagmus in humans: normal values of amplitude, time constant and asymmetry. Annals Otology, Rhinolology, Laryngology, 98:741-746, 1989. In VVI, a person is rotated with a visual surround or target also present. The most useful variant of this is to have a person look at (fixate) a laser that is fixed to the rotatory chair. This type of VVI is a good index of ones CNS's ability to suppress nystagmus, and thus it is a measure of cerebellar and brainstem function. If patients is not told to keep their eye on the chair-fixed target, the test is meaningless. This is a very common error. Another type of VVI is done by simply rotating the person in the light. Here the person has both OKN and vestibular input. For this this type of VVI gain should be close to 1.0. If it is more than this, you have a technical problem. If it is less than this, at low-frequency, you either have a calibration problem or an uncooperative patient. Sometimes patients are poorly instructed and don't know that they are supposed to keep their eyes open.